First called an "Alligator Pear", the Avocado was used as a hedgerow windbreak for Citrus orchards in Southern California. The Hass Avocado was a chance seedling discovered by Mr. Rudolph Hass. Even though the plant was intended as rootstock for another popular variety of the time, his children so preferred the fruit that Rudolph patented it in 1935. We understand why! The Hass produces outstanding fruit. Prized for its extraordinary, green-skinned, oval fruits which have a pebbly texture and present a pleasing appearance against the lush, glossy foliage. Hass Avocado, with its creamy slightly nutty flavor, is the standard that all Avocados are compared to today. This fruit will certainly delight your taste buds and be a delicious addition to a variety of dishes. Try the latest trend... Avocado Toast! Sprinkle coarse ground pepper on top, spritz with Lemon juice and drizzle it a bit of extra virgin olive oil. Mmm, delicious and filled with very healthy monounsaturated fats and fiber. Trying the popular Keto diet? Swap out for low carb bread. Either way, you'll be eating clean. Worldwide, Hass is the most popular commercially-grown avocado. Its durability in transport and reliable shelf life, make it a popular choice among growers and customers alike. While you can generally find Avocados at the grocery store, it's such a treat to be able to grow your own. You'll save money and gain a valuable, attractive plant for your backyard permaculture orchard. When grown outside, Avocados are a beautiful large evergreen tree that can be prune to any height. They do make a wonderful hedge plant which was their primary purpose in the early 1900's. Hass Avocado trees are very sensitive to poor draining soils and care must be given when planting. If soil drainage is a concern, mound or build a raised bed at least 12 to 18 inches above the soil line and plant in the raised bed. The Avocado's root system is sensitive to being disturbed. 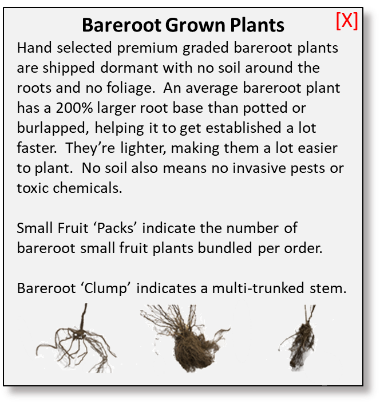 Take care when transplanting not to damage or disrupt the root. Avocados can be grown as a houseplant but will not produce fruit as an indoor/outdoor plant under normal circumstances. They can, however successfully produce fruit in containers in a heated greenhouse. In Zone 9, this popular Avocado will require occasional protection from the cold, so a southwest-facing exposure with good winter air circulation is recommended. In Zone 9, the Hass Avocado will produce without a pollinating companion. When grown in zones 10 and 11, the Hass Avocado needs a pollinating partner plant, such as the Bacon, Fuerte, Zutano and Sir Prize varieties. The Hass is an 'A' type flower and ripens April - October and the other varieties listed have 'B' type flowers that ripens November - June. Both are outstanding flavored selections. Consider planting 2 different varieties for a year-round harvest at your fingertips. Avocados are heavy feeding plants and are sensitive to micronutrients deficiencies. Avoid this by applying a balanced Organic Fertilizer such as Dr. Earth Life Organic and Natural All-Purpose Fertilizer quarterly. Remember to mulch your Hass Avocado 4 inches deep to the outside of the canopy and be careful not to overwater. Hass Avocado is considered a black-skinned variety, though it is most often harvested green. This is a sharp contrast to the light green fruit within. The best way to store Avocados is to leave them on the tree until needed. Hass will hang for months just waiting to be picked. Once picked, keep the fruit out to soften it. As the fruits ripen, their skin transitions to a dark purple/black. Once soft they can be stored for a few extra days in the refrigerator. Once planted the Hass Avocado will produce fruit in about 5 years. So be patient, this is a fruit worth waiting for and don't wait too long to plant one. Order today! Avocados are native to South-Central Mexico and have been traced as far back as 7000 BC. They were likely cultivated since the Inca civilization in 750 BC. But it wasn't the early 1900's that growers saw a potential for the Avocado in the United States. The Hass was discovered in late 1920's by a postman named Rudolph Hass, who spent all his money on the purchase of a small plot of land in La Habra Heights, California, in order to satisfy his dream of growing avocados. With only enough money left to purchase seed from a local avocado pioneer/grower A.R Rideout, he planted with the intent of grafting over the most popular industry-standard of the day, the Fuerte avocado. Hass was not very successful in his initial attempts to graft his seedling rootstock. After two years worth of attempts, he had finally got all but one to take. After it began to fruit, the story goes, he had decided to take it down and start over. His children talked him out of it, proclaiming the variety to be much better tasting than Fuerte. Today, this is often debatable, as the Fuerte is itself a very high-quality avocado. Hass did see quality in the fruit and took it to Harold Brokaw of Brokaw Nurseries, which today is the largest grower of avocado grafts and seedlings in the nation. Brokaw agreed to propagate and help patent the variety for a 75 percent share of the revenue. The Hass was a more productive variety than Fuerte and came in at a different time of the year, so initial sales were brisk, with Brokaw quite frequently selling out. It is said, though, that the money soon dried up as farmers began grafting their own trees, and by the time the patent expired in 1952, only a little over $5000.00 in total revenue had been collected. It was in that same year that Rudolph Hass passed away; leaving his name on the hard fought Hass avocado as the world wide top seller.